Ephemeris for Thursday, November 1st. The Sun will rise at 8:20. It’ll be up for 10 hours and 10 minutes, setting at 6:31. The Moon, 1 day past last quarter, will rise at 2:14 tomorrow morning. Let’s look ahead at the skies for the month of November. The Sun is still moving south rapidly. Daylight hours in the Interlochen/Traverse City area and will drop from 10 hours and 10 minutes today to 9 hours 5 minutes on the 30th. The altitude, or angle, of the Sun above the southern horizon at local noon will be at 30 degrees today and will descend to 23 and a half degrees on the 30th. The altitude of the Sun in the Straits area will be a degree lower. Local noon, this month, will be about 12:30 p.m. once we’re on standard time. The Leonid meteor shower will reach multiple peaks from the 16th through the 21st and is expected to be lackluster and may only produce 10 to 15 meteors per hour. But the Leonids can be surprising. Star Chart for November 2018 (9 p.m. EST November 15, 2018). Created using my LookingUp program. Click on image to enlarge. 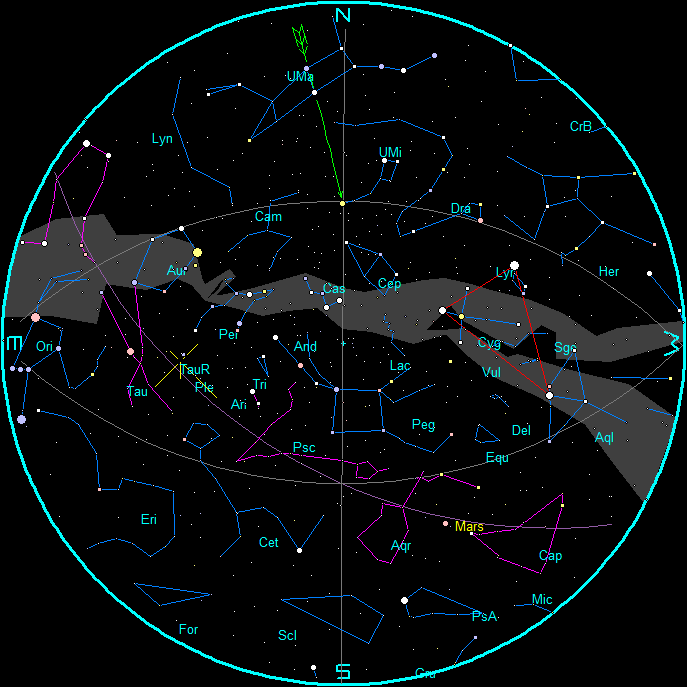 The planets and stars are plotted for the 15th at 9 p.m. EST in the evening and 6 a.m. for the morning chart. These are the chart times. Note that Traverse City is located approximately 45 minutes behind our time meridian. (An hour 45 minutes behind our daylight saving time meridian during EDT). To duplicate the star positions on a planisphere you may have to set it to 1 hour 45 minutes earlier than the current time. Note the chart times of 9 p.m. and 6 a.m. are for the 15th. For each week before the 15th add ½ hour (28 minutes if you’re picky). For each week after the 15th subtract ½ hour. The planet positions are updated each Wednesday on this blog. For planet positions on dates other than the 15th, check the Wednesday planet posts on this blog. Star Chart for November moprnings 2018 (6 a.m. EST November 15, 2018). Created using my LookingUp program. Click on image to enlarge. The original morning chart uploaded November 1st was outdated. This corrected chart was uploaded November 6th. For a list of constellation names to go with the abbreviations click here. Pointer stars at the front of the bowl of the Big Dipper point to Polaris the North Star. The Summer Triangle is in red. 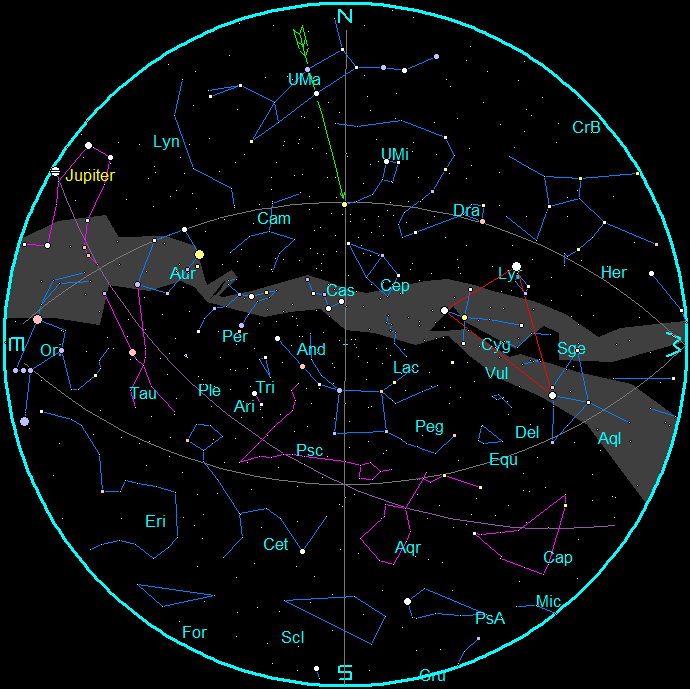 TauR on the evening star chart can be used as the radiant for the North and South Taurid meteor showers. LeoR on the morning star chart is the radiant of the Leonid meteor shower which peaks between the 16th to 21st. Date Astronomical Nautical Nautical Astronomical Start End Illum. Twilight calendar was generated using Cartes du Ciel (Sky Charts). 27 Tu 04:10:00 AM Mercury Inferior Conj. or calendar pages for your time zone. Ephemeris for Halloween, Thursday, October 31st. The sun will rise at 8:19. It’ll be up for 10 hours and 13 minutes, setting at 6:32. The moon, 3 days before new, will rise at 6:07 tomorrow morning. Let’s look at the skies for the month of November. Comet ISON will continue to brighten this month, but will encounter bright twilit skies as it closes in with the sun the week of Thanksgiving. I’m hoping the comet will be visible to the naked eye by mid-month. The sun is still moving south rapidly. Daylight hours in the Interlochen/Traverse City area and will drop from 10 hours and 10 minutes tomorrow to 9 hours 5 minutes on the 30th. The altitude, or angle, of the sun above the southern horizon at local noon will be at 30 degrees tomorrow and will descend to 23 and a half degrees on the 30th. The altitude of the sun in the Straits area will be a degree lower. Local noon, this month, will be about 12:30 p.m. when standard time returns. 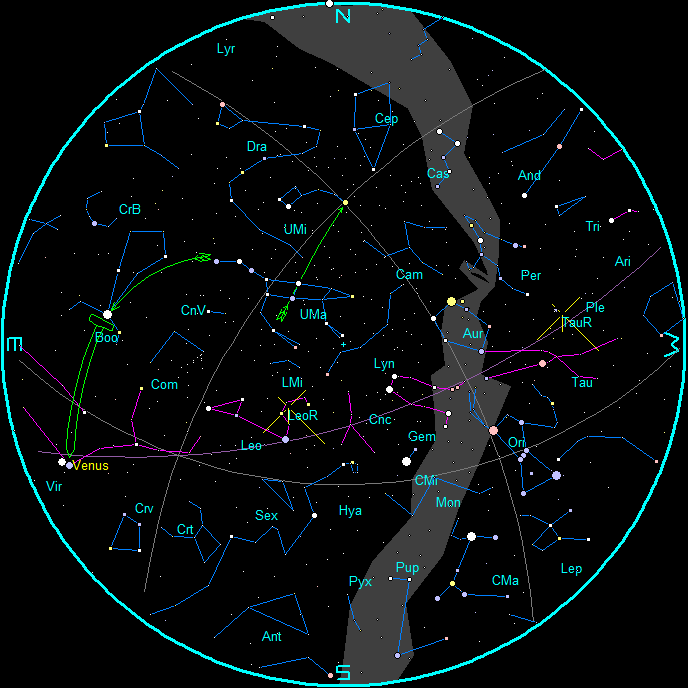 Star Chart based on 9 p.m. on November 15, 2013. Created using my program LookingUp. The constellation abbreviations, names and bright star names are found here. The red triangle is the Summer Triangle. The arrow through then front of the Big Dipper point to Polaris. The path of Comet ISON and Comet Encke for November 1st through 14th, 2013. Created using Cartes du Ciel. Labels contain date and predicted magnitude. Click to enlarge. Comet ISON will remain an early morning comet for November and most of December. The oddball object with the skewed label is the moon. The path of Comet ISON and Comet Encke for November 15th through 28th, 2013. Created using Cartes du Ciel. The planets, Sun and Moon have been removed for clarity. Labels contain date and predicted magnitude. Click to enlarge. The above two images are from my program Prospects for Viewing Comet ISON to be given tomorrow night at the regular meeting of the Grand Traverse Astronomical Society starting at 8 p.m. at Northwestern Michigan College’s Rogers Observatory south of Traverse City on Birmley Road. Local school groups or clubs ca request the program by commenting to this post or emailing to info@gtastro.org.